From November 14 to December 10, we invite you to enjoy the traditional Expo Trade/Fair CANACO Mazatlan 2018 that is organized by the Chamber of Commerce, Services and Tourism of Mazatlan with the aim of providing a forum to expose part of the trade and services offered at the port. In this edition attendees will have the opportunity to visit 150 stands and enjoy rides, gastronomic pavilion and concerts where the saucer will be the singer, composer and Mexican actor Carlos Rivera, who will fill with his music and charisma the stage of the Expo Trade/Fair on Saturday, December 1st. 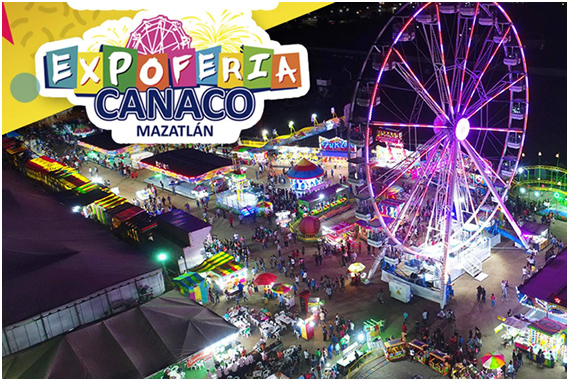 Go and have fun in a completely family environment at the Expo Trade/Fair CANACO Mazatlan 2018!